Well, I’m a little excited about this pattern release. It’s my Fancy Easter Egg foundation paper pieced pdf pattern. I hope you’ll love it too! For me Easter is such a lovely time of year (i’m not just saying that because of all of the chocolate!). I love the lighter days and the bulbs starting to bloom in the garden. There’s a real optimism as the days start to get a touch warmer.When I am sewing I start to look at brighter and fresher prints and colours, are you the same? This fancy egg is a perfect way to dip your toe into those pastels in your stash! This is a relatively simple pattern but there are a few small pieces around the egg to help create a nice curved shape. If you take your time I am sure you will be ok! It’s a lovely pattern for featuring lots of lovely prints as there are numerous stripes and zig-zags. Alternatively you can go for something more classy and stylish by restricting your colour palette. You can really create an egg to suit your taste (without the calories). 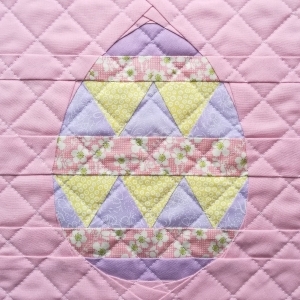 The ‘Fancy Easter Egg’ Foundation Paper Piecing pattern makes an 8″ block. I frequently like to turn my 8″ blocks into mini quilts as I like to use them to decorate my studio with them. You could of course use your block to incorporate into a larger quilt or as panel on a bag or even turn it into a cushion for the sofa! The pdf pattern is presented over 6 pages, 2 of which are the pattern pieces. The pattern includes a full colour image of the design, a colouring diagram so you can plan your fabric placement and a diagram on how to assemble your block. There are also some tips as to how to print your pattern correctly first time around. All of the pattern pieces have been drafted digitally and I’ve included a 1/4″ seam allowance around each of the sections to make assembly as easy as possible for you. If you’ve made a fancy egg of your own don’t forget to share your makes. Use #fancyeasteregg when you’re uploading pictures of your work on social media so we can all see your great work! You can also join Victoria Peat :: In the Sewing Room on facebook and share your pictures there, or ask questions if you are stuck! 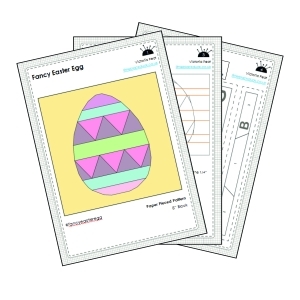 If you would like to buy a copy of the ‘Fancy Easter Egg’ FPP pdf pattern you can get a copy from my Etsy store or my Craftsy store for around £3.50. 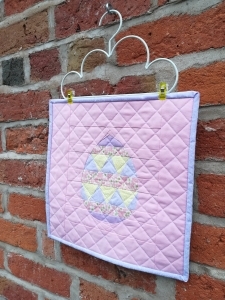 I hope you love my Fancy Easter Egg FPP pattern, it’s a great opportunity to use some of those precious scraps that you’ve been saving because they’re just too good to throw out!